A high resolution digital colour camera that captures fine details of the retina, for diagnosis, monitoring and to guide treatment of disease such as age-related macular degeneration (AMD) and diabetic retinopathy. This may assist in diagnosing or explaining your condition, and may be used as a baseline for future reference. A high resolution digital imaging camera utilising specialised filters to study certain layers of the retina, providing further information in the diagnosis, monitoring and prognosis of retinal conditions such as age-related macular degeneration(AMD) and central serous chorioretinopathy (CSR). A high resolution digital imaging camera with specialised filters used to study the blood vessels of the retina and the deeper choroidal vessels. Fluorescein (yellow) or Indocyanine Green (green) dye is injected into a peripheral vein in the arm or hand, following which our certified orthoptist/photographer will capture a series of time-dependent retinal photographs. This provides intricate details of retinal and choroidal vessels essential for the diagnosis and management of conditions such as macular degeneration, diabetic retinopathy, retinal vein or retinal artery occlusion. No X-rays are used in either of these tests. Both types of angiogram are considered very safe and serious side effects or reactions are very uncommon. It is important for you to tell us if you have any allergies or sensitivities, and if you have had a fluorescein or ICG angiogram before. If you require one of these tests, you will be given extra written information, and any further questions you have about the test/s will be answered. OCT uses light reflected from the back of the eye to create cross-sectional images of the retina and surrounding tissues. It is a painless, non-invasive test which gives valuable extra information, especially in conditions affecting the surface of the retina such as macular hole, epiretinal membrane and vitreomacular traction. OCT is also very useful in diagnosing and monitoring conditions such as diabetic macular oedema, macular degeneration (AMD), and central serous chorioretinopathy. It has become essential in guiding treatment of wet macular degeneration with Lucentis. OCT is also extremely helpful in patient education. Retina Associates has the latest Spectral Domain High Resolution OCT technology, and was one of two Australian sites in the international Early Access Program which evaluated the Cirrus HD-OCT prior to its commercial release. Our doctors have a special interest in the use of OCT technology for the assessment of retinal diseases, and have given many lectures on this topic. 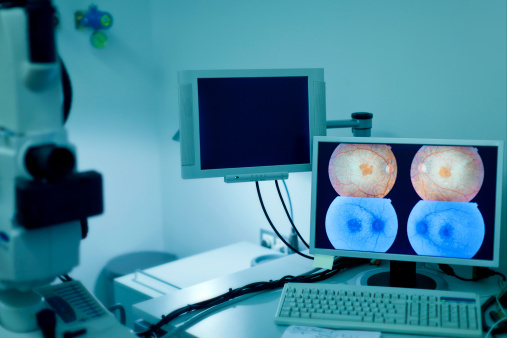 Ultrasound scans are used to assess the retina and other structures at the back of the eye, often when it is not possible to see inside the eye – for example due to vitreous haemorrhage (bleeding into the vitreous gel) or cataract. This is a painless test where local anaesthetic drops are instilled, a liquid gel is placed on the eyelids or eye, and a small ultrasound probe is placed on the lids or the eye. B-scan uses sound waves to take cross sectional pictures of the eye. B-scan ultrasound may help identify the cause of bleeding in the eye, such as retinal tear or proliferative diabetic retinopathy. It may be the only way of diagnosing a retinal detachment in eyes where it is not possible to see the retina using an ophthalmoscope. A non-invasive, computerised diagnostic instrument used to monitor your peripheral vision and provide information on the function of the retina, optic nerve and brain. It is commonly used for conditions such as glaucoma, optic neuropathy, retinitis pigmentosa and strokes affecting vision.